2015 was expected to be a difficult year with the introduction of the new syllabus. However, many students performed well considering the change. There were those who might have been a little apprehensive or not as accepting at the start, with some students having studied with CIMA (and the old syllabus) for a long time. We can see that students performed well particularly in E1 'Organisational Management' and F1 'Financial Reporting and Taxation'. 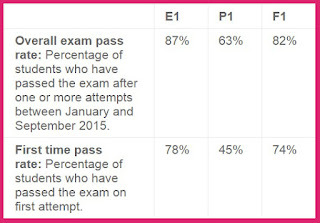 In comparison you will see that pass rates for the P1 pillar, 'Management Accounting' were a fair bit lower. We know from speaking to many of our students that the 'performance' pillar in general is often seen as more difficult than the others, so it is hardly surprising that results have been lower in this area. For those of you moving onto P1 therefore, it might be worth noting that extra attention may be required on this area of the syllabus. Overall, it appears that the new Objective Test format has been well received and many students achieved good results in the first year of the new exams. However, there is no room for complacency in the other pillars, so we will all need to work hard to continue to be even more successful in 2016! The year started off with some poor results all round for the case study. This would be expected however considering the syllabus and structure change. Operational level saw some mixed results, starting off relatively well, considering the new setup. However, performance seemed to drop in the second half of the year, with pass rates in August only reaching 34%! This may be the result of a trickier than usual exam, but it does highlight the fact that just because performance was high in the previous exam, doesn't mean that performance is definitely going to be high in your exam! So what can we take from all of this? There is not a great deal that can be directly linked to the 2016 exams, as the results are now behind us, it is instead important that you can learn from the results and see that there are still areas in which you can improve your studies, such as by not becoming complacent when it comes to the case study exam (don't expect the exams to get easier!). Or from the Objective tests, where you will have to remember to put in as much effort as you can in all of the pillars at operational level, as you are never guaranteed a pass (especially first time around!). However it might be worth putting in that little bit of extra effort into P1 given the recent results.